Particle reinforced metal matrix composites have many problems such as complicated preparation process, high production costs, weak interface bonding between the ceramic and metal matrix, uneven distribution of ceramic particles and so on. 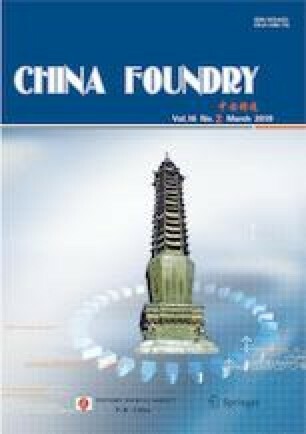 To solve these problems, the method of “shoot mixing + pressure compositing” (SM-PC) and a mixed regulation model of ceramic particles with molten steel were proposed. In the shoot mixing process, the special designed die casting equipment was used to make the particles with the molten metal mixed in the runner at a certain ejection speed (150 mm·s−1). After the mixture is filled with the mold, the pressure is maintained until the end of solidification. In order to optimize this method to obtain the more uniform particle distribution, the parameters (ejection speed, preheating temperature of particles, the shape and size of runner) in the model were selected for sample preparation. Taking the distribution index of particles as the evaluation criterion, it is concluded that the uniform distribution of particles can be promoted with the increase of ejection velocity, the increase of particle preheating temperature, and the small change of gate size. When the preheating temperature of particles was 1,100 °C, and the shape of the runner was trumpet, the optimal particle distribution composite parts was obtained. Meanwhile, the particles and the matrix achieved strong interface bonding — “Class I interface” under the pressure compositing, even though they’re non-wetting. Qi Dong Female, born in 1987, Ph.D. Her research interests mainly focus on wear resistant metal materials. This work was financially surpported by Central Universities under Grant (NO.2018YJS139).